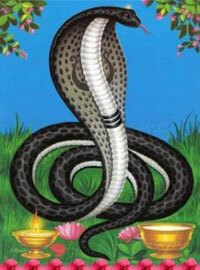 Nag Panchami is a traditional worship of snakes or serpents observed by Hindus throughout India, Nepal and other countries where Hindu adherents live. On this day women pray for the well being of their brothers and families. They worship the Nag Devta and offer milk to them.